Do you own a weather radio, or are looking to purchase one? If so, this article should give you a bit of information on the types of frequencies you should be looking for. Whether you use a weather radio only for alerts or to scan channels when you are out and about, it’s important to know what type of frequencies are out there and how to access them. If you are new to using weather radios, then you might have heard the term, ‘NOAA,’ and might be unsure exactly what it means. In this article, we aim to answer the question, ‘what are NOAA weather radio frequencies?’ and hope to tell you a bit about them and how they can be helpful to you. The NOAA Weather Radio Network is a national system in the United States that provides automatic broadcasting of accurate weather conditions and forecasts from the National Weather Service (NWS). This broadcast runs 24-hours a day, seven days a week, and includes alerts and warning when any severe weather is to strike, such as hurricanes, tornadoes or significant storms. This network works with the Emergency Alert system of the Federal Communication Commision, making it the only source available for extensive weather and emergency information on offer to the public. The NOAA broadcast system can be a lifesaver for people who are perhaps traveling away from their regular place of residence, for example, those who may be camping, hiking, mountain climbing or merely enjoying a trip somewhere away from home. These individuals may be in areas that are remote and therefore have poorer reception, especially when in mountainous or hilly areas. Being able to listen to the NOAA radio broadcast is very important when traveling in rural, less receptive areas as it can help keep you and your companions informed of any adverse weather conditions around you, as well as any other major threats to your livelihood. Does NOAA Cover All Areas? If you are wondering how many areas the NOAA covers, it has more than 750 transmitters that cover almost 90% of the United States, along with adjacent coastal waters, the US Virgin Islands, Puerto Rico, and US Pacific Territories. The National Weather Service provides maps of NOAA radio coverage state by state and lists their coverage by county. There are also computer-projected signal reception maps available on their official website; therefore, it would be wise to check before you travel. If you want to receive a NOAA radio frequency, you can do so using a simple weather radio. Some weather radios will come with the NOAA frequencies pre-programmed, making it easier for you to get the news quicker. Others, however, will have to be scanned automatically. If you want to program your weather radio to receive only weather alerts specific to your location, you can do this by looking up the SAME codes for your area, which can easily be found online. There are many NOAA weather radios on the market, and they come in a variety of types, and prices. You will be able to find them in your local electronic stores as well as directly from manufacturers online, or e-retail sites such as Amazon. The majority of alert radios sound a unique alarm tone whenever an NWS alert is broadcast. This helps to make sure you will notice the warning as it is alerted, always keeping you informed no matter where you are. Mosg weather radios are portable and include more than one way to receive power. Many include battery powered, and rechargeable battery-powered, and the newer models include solar-powered options; some might even have a manual hand crank – all in the one package. It is possible to find desktop weather radios that are better for indoor use, and handheld pocket-sized weather radios which are easy for transporting around on a belt or in a pocket. When purchasing a NOAA weather radio, you should look for the alarm tone. The alarm is one of the most important features in a weather radio, as it means you can keep the radio on but silent, and only hear noise when a message is broadcast. If an emergency occurs, the NWS will automatically interrupt any routine weather forecast by sending out a unique sound that alertss listeners in a particular area. Also, it would be best if you looked for a weather radio which includes more ways to generate power than one, as should you run out of one method of charge, you can at least rely on another approach. 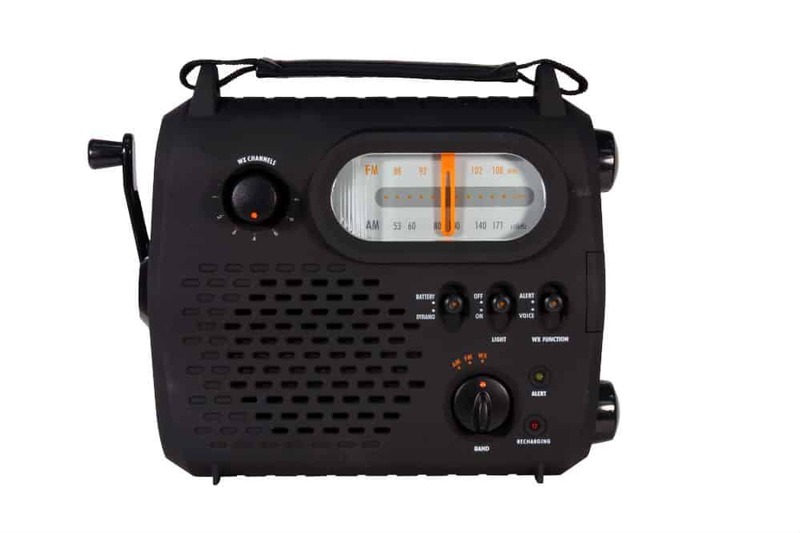 Hand crank weather radios are perfect for situations where electricity is out as they merely require a little manual labor to generate power, and so can be live savers during major storms. If you are traveling in the near future, even if it’s just a camping trip, then we highly recommend investing in a NOAA weather radio as they can really be helpful whenever you need to keep informed about current weather conditions near you. Many people have benefitted from these NOAA weather broadcasts when traveling as they would have never had any other means of knowing what the forecast was, and could have potentially walked into a storm without realizing. The NOAA broadcast has been known to save lives in severe weather, and many people are grateful for this broadcast as it’s available 24/7. We genuinely hope that this article has helped find out about the NOAA weather frequencies, and by now, you should have a better idea of what it is and how to receive them. Previous Post What is a Crank Radio? Next Post What are NOAA Weather Radio Frequencies?